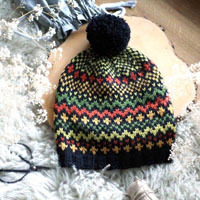 Go to original pattern for design DROPS 88-26. 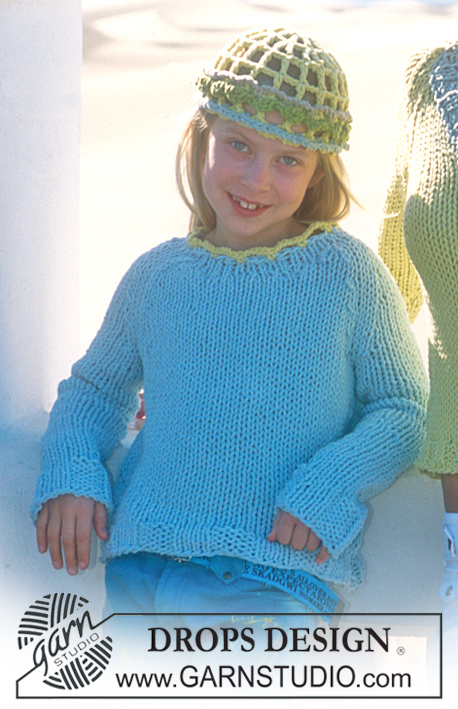 Children’s knitted jumper with raglan and crochet hat in "Ice"
DROPS Circular needle size 8 and 9 mm. DROPS Double pointed needles size 8 and 9 mm. DROPS Crochet hook size 6 mm. Knitting tension: Remember needle size is only a guide. 10 stitches x 14 rows with needle size 9 mm and stocking stitch = 10 x 10 cm. Rib: * K4, P4 *, repeat from *-*. All decreases are worked from the right side! slip 1 stitch as if to knit, K1, pass slipped stitch over. 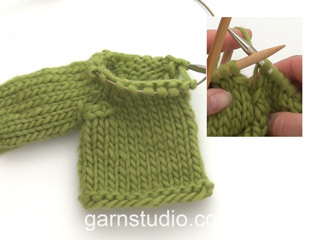 Knitting tip: If your knitting tension is not correct in height and you work too tightly, the decreases for raglan will be too short and the armhole too small. You can adjust by working 1 extra round without decreases regularly between decreases. 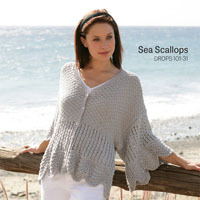 Body: Loosely cast on 64-72-80-88-96 stitches with circular needle size 8 mm and ice blue Ice and knit 1 round. Then work rib until piece measures 4 cm. Insert 1 marker thread in each side. Change to circular needle size 9 mm and continue with stocking stitch at the same time as you adjust the number of stitches to 68-72-80-88-92 stitches on first round after rib. Remember the knitting tension! When piece measures 16 cm increase 1 stitch on each side of marker threads in each side = 72-76-84-92-96 stitches. When piece measures 23-25-27-28-29 cm cast off 6 stitches in each side for armholes (i.e. 3 stitches on each side of marker threads) = 30-32-36-40-42 stitches left on front and back pieces. Lay piece to one side and work sleeves. Sleeve: Loosely cast on 16-16-16-24-24 stitches with double pointed needles size 8 mm and ice blue Ice and knit 1 round. Then work rib until piece measures 6 cm. 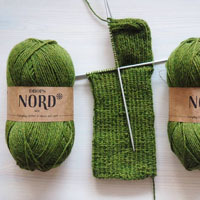 Change to double pointed needles size 9 mm and continue with stocking stitch at the same time as the number of stitches is adjusted to 16-18-20-24-24 stitches on first round after rib. When piece measures 10 cm increase 2 stitches mid under sleeve every 8-8.5-10-16-12 cm a total of 4-4-4-3-4 times = 24-26-28-30-32 stitches. When sleeve measures 36-40-44-46-49 cm cast off 6 stitches mid under sleeve = 18-20-22-24-26 stitches. Lay piece to one side and work 1 more sleeve. 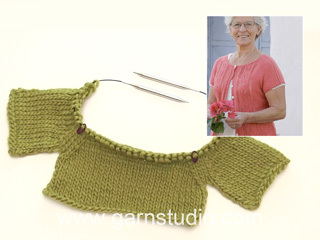 Yoke: Place sleeves on same circular needle as body where you cast off stitches for armholes = 96-104-116-128-136 stitches. Insert 1 marker thread in all transitions between body and sleeves (= 4 marker threads). Work 0-0-1-1-0 round before starting to decrease. Read the next 2 paragraphs before continuing. 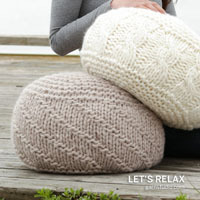 Raglan decreases: Read Knitting tip! Decrease 1 stitch on each side of all marker threads (= 8 decreases). Decrease every 4th round - see Decrease tip: 1 stitch 3-3-2-2-2 times and then every 2nd round: 1 stitch 3-4-6-7-8 times. 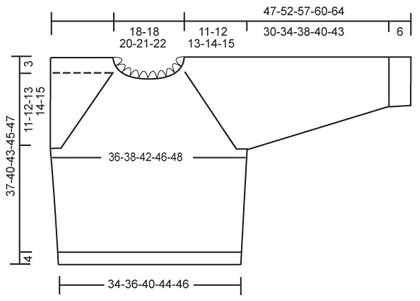 Neckline: At the same time, when piece measures 29-32-34-36-38 cm place the middle 6-6-6-8-8 stitches on 1 thread for neck, then decrease towards neck every 2nd row: 1 stitch 4 times. After all the decreases to raglan and neck there are 34-34-38-40-40 stitches left on needle. Neck: Knit up 14 to 18 stitches (incl. stitches from thread) in the front of neck with ice blue Ice and place all stitches on double pointed needles size 8 mm = approx. 48 to 58 stitches. Work 3 rounds stocking stitch at the same time as the number of stitches is adjusted to 40-40-41-45-46 stitches on first round. 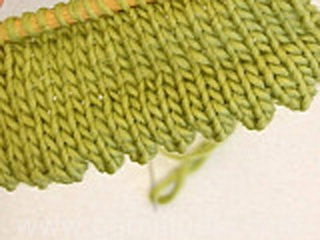 Cast off – so the cast-off edge is not tight, you can make 1 yarn over after approx. every 5th stitch at the same time as you cast off (cast off the yarn overs as well). Assembly: Sew openings under sleeves. Crochet edge: Work with hook size 6 mm and apple green Ice around neckline as follows: 1 double crochet in first stitch, * 5 chain stitches, skip 2 stitches, 1 double crochet in next stitch *, repeat from *-* and finish with 5 chain stitches and 1 slip stitch in first stitch at beginning of round. no 04, beige, no 11 green and no 16, mint. Crochet 8 chain stitches with hook size 6 mm and apple green and form them into a ring with 1 slip stitch. Round 1: 6 chain stitches (= 1 double treble crochet + 2 chain stitches) * 1 double treble crochet around ring, 2 chain stitches *, repeat from *-* a total of 7 (8) times and finish with 1 slip stitch in the 4th chain stitch at beginning of round = 8 (9) chain-spaces. Round 2: 6 chain stitches (= 1 double treble crochet + 2 chain stitches), in each double treble crochet work: * 1 double treble crochet, 2 chain stitches, 1 double treble crochet, 2 chain stitches *, and finish with 1 double treble crochet in last slip stitch from the previous round, 2 chain stitches and 1 slip stitch in the 4th chain stitch at beginning of round = 8 (9) double treble crochet-groups. Rounds 3-4 (3-5): 6 chain stitches (= 1 double treble crochet + 2 chain stitches), in each double treble crochet work: * 1 double treble crochet, 2 chain stitches *, and finish with 1 slip stitch in the 4th chain stitch at beginning of round = 16 (18) double treble crochets. Round 5 (6): 1 chain stitch, 1 double crochet in the first treble crochet, * 4 chain stitches, 1 double crochet in the next treble crochet *, repeat from *-* and finish with 4 chain stitches and 1 slip stitch in the first chain stitch at beginning of round. Cut and fasten threads. 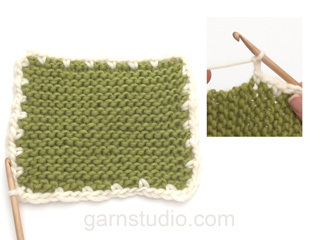 Border-1: Work with mint in the chain-spaces on row 5 (6) as follows: * 1 double crochet around the chain-space, 4 chain stitches *, repeat from *-* and finish with 1 slip stitch in the first double crochet at beginning of round. Border-2: Work with beige in chain-spaces on row 4 (5) as follows: * 1 double crochet around chain-space, 4 chain stitches *, repeat from *-* and finish with 1 slip stitch in the first double crochet at beginning of round. Border-3: Work with green in the chain-spaces on the same row as Border-2 as follows: * 1 double crochet around chain-space, 4 chain stitches, 1 double treble crochet in the first of the 4 chain stitches *, repeat from *-* and finish with 1 slip stitch in the first double crochet at beginning of round. Muchas gracias por las aclaraciones. Entiendo entonces que trabajo ida y vuelta por separado cada parte del delantero (raglan y disminuciones) osea los puntos que quedan repartidos en dos grupos al dejar 6 en un gancho auxiliar. ¿Es así? Buenos días, vuelvo a atascarme ;-( He acabado con el RAGLA, tengo 48 puntos en la aguja circular. ¿Cómo sigo el ESCOTE? ¿dejo 6 puntos de los 48 o de 24 en espera? ¿dónde hago las disminuciones de la segunda fila 4 veces?. Gracias de antemano, saludos. Muchas gracias por la respuesta, creo que ya lo entiendo. Es mi primer jersey con raglan! Buenos días. He acabado de tejer el cuerpo en aguja circular, también he tejido las mangas por separado en circular. No se bien cómo unir las mangas al cuerpo y continuar con el raglan. El video de la union que hay en el patrón no usa una pieza de cuerpo y espalda cerrada en circular como yo he hecho. Gracias!!!! Med raglan er det veldig viktig at strikkfasheten innholdes. Har du riktig strikkfashet? Kan det passe at ærme skal være så smal? En raglanfelling strikkes ved at bolen og ermene settes sammen på samme rundp der ermhullet begynner. Videre strikkes det rundt og det felles m på hver side av alle overgangene mellom ermer og bol - dvs 8 fellinger pr omg. Dette vil stå nøye forklart på oppskrifter med raglanfelling - da er det bare å følge oppskriften! Hvordan strikker en raglan felling?